The flight was on time and we had a smooth ride to Haneda. ANA ‘s inflight service was excellent! We had a choice of Japanese salmon or Thai curry, followed by our favorite ice cream! So refreshing! Our driver kindly welcomed us at the Fukuoka Airport upon arrival and transported us to the Hotel Clio Court where we checked in for a good night’s sleep. It was a cool and rainy spring day. We visited the Dazaifu Temmangu shrine, the shrine was dedicated to the spirit of Sugawara no Mi-chizane, a scholar and politician of the Heian period. We followed the custom and prayed for good fortune. 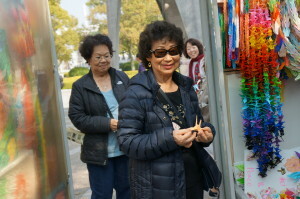 Umegaemochi (A popular traditional mochi with the peach flower stamp on it) was being sold by many vendors near the shrine. Many of us enjoyed it on the bus ride to our next destination. Our lunch, we were each served an individual steak on a skillet. Delicious! 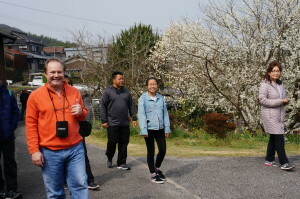 After lunch, we headed towards Imari village. Caught gondola up to the Inasayama Mountain and to our restaurant, due to the rain we didn’t have match view outside but the food was wonderful. Our dinner including Amaebi sashimi, Tempura, Chawan Mushi and many more! 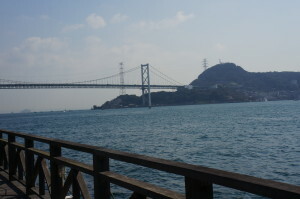 We covered many historical places in Nagasaki. 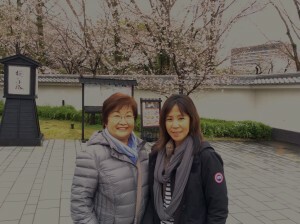 First Nagasaki Atomic Bomb Museum & Peace Park. 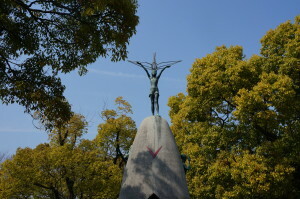 At the north end of the park was a 10-meter-tall Peace Statue. The south end features a Fountain of Peace. Both monuments have been donated from various countries around the world. We also visited Dejima, this small island like place used to served as the location for the Dutch East India Company’s trading post. And was the entry point for the commercial and cultural exchange with the West for over 200 years. 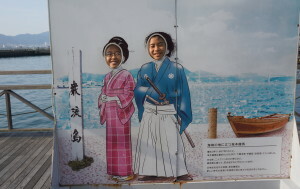 Here we had all worn kimono! 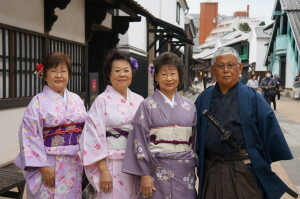 Usually, getting into a traditional kimono would take more than an hour but thanks to the experienced staff we got dressed in less than ten minutes. Everyone looked great! Then we visited Oura Cathedral. It is the oldest wooden church of Gothic architecture in Japan. After that we strolled around Glover Garden and visited the European style house on the property. 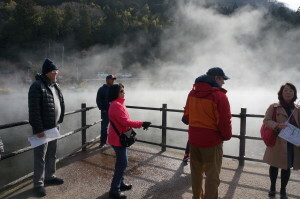 On Day 5 we visited the Unzen Jigoku Onsen, which translates on Unzen Hell Hot Spring. Known for it’s distinctive sulfur scent, the steam and hot air blows from below the ground. 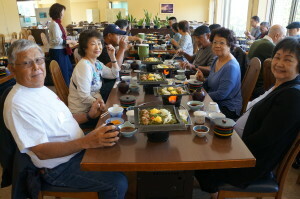 For lunch, we had Gu-zoni local pot dish at beautiful seaside hotel restaurant. 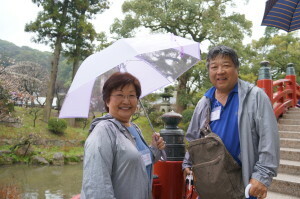 After lunch, we took pleasant 30 minutes ferry ride to Kumamoto. 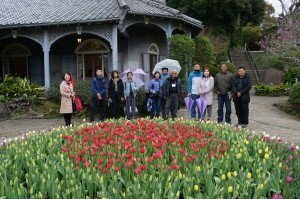 First we visited Suizenji-garden. 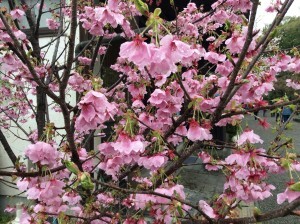 We were blessed with early blooming Yamazakura -cherry blossom. 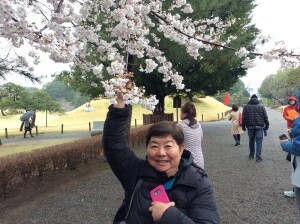 A beautiful Japanese–style landscape garden designed to give a small scale view that you can see when travelling along the old road from Kyoto to Tokyo(Edo) we visited Josaien,the foot of Kumamoto Castle, where there were lots of shops and restaurant. 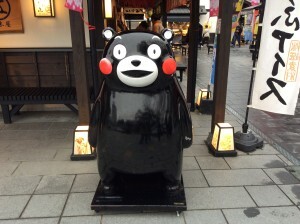 We met Kuma-mon, the mascot of Kumamoto Prefecture. 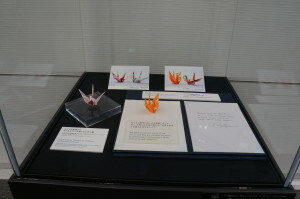 He was born on Mar 12th 2011, to commemorate the completion of the Kyu-shu shinnkansen ( Bullet Train). 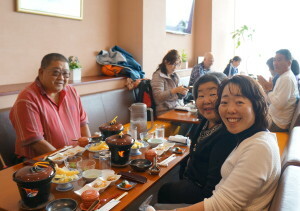 We had dinner on our own near the Hotel Nikko Kumamoto we stayed. Hi Kuma-mon ! We headed east for strawberry picking farm. This strawberry is well known as Hinoshizuku (juicy). So sweet strawberries. Then at lunch time, some of us tried Horse meat which is a local delicacy. We saw Mt. Aso from an open field in Kusasennri . It was covered with Snow! The Mountain air was so pure and crisp, but it was too cold to stay outside. Refreshing! Our driver, took us there safely! Thank you! Next stop was Takasaki Monkey Park. There was large sign warning you not to stare a monkey straight in the eyes, not to feed them, and not to disturb them.The monkeys seemed totally oblivious to us! 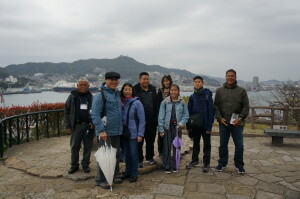 Some of us took a gondola car to the top of Mount Takasaki. 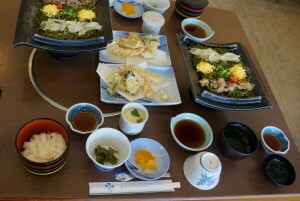 After we cheked in at our hotel (Yufuin Sansuikan) we had Japanese kaiseki Dinner in the Banquet room. Everyone was wearing Yukata at dinner. KANPAI! 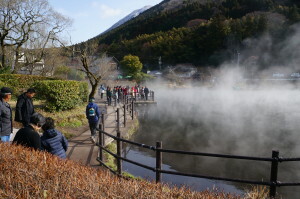 We strolled along Kinrin Lake “Gold Scale Lake”. The name derives from the reflection of the sun against the fish in the lake. 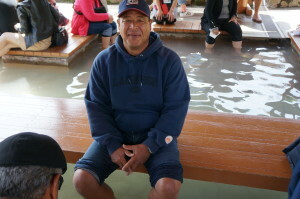 There was a hot spring spot at the bottom. What a beautiful and mystical scene! We then walked to nearby Yunotubo Yokocho , which is an alley filled with shops selling local specialty food and souvenirs. 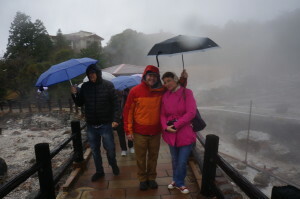 Then we visited Umi jigoku (ocean hell) natural hot spring where we enjoyed a foot bath. So relaxing! We visited robot factory. 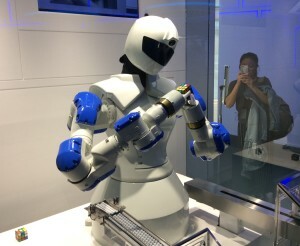 These robots can perform complex and difficult tasks. For dinner, we ate Fugu (Balloon Fish), prepared by a licensed chef at Heike tyaya restaurant, also the maginificent view of the Kan-mon Bridge. 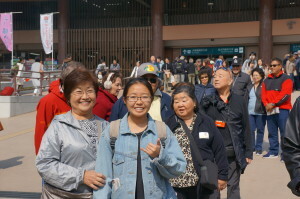 We had nice breakfast and walked to the Karato fish market where you can find various kinds of fresh fish, dry seafood, seaweed, and local delicacies. The fresh sushi was so delicious and reasonable. For example, the Maguro ootoro-(fatty) was 300 yen(less than 3 dollars) Toro salmon 200 yen, and Fugu 100 yen. This market is a definite must for sushi lovers! 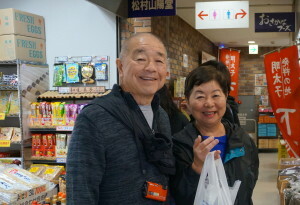 After a little bite we headed towards Akiyoshido Shonyuudo, Japan’s longest limestone cave. The cave has various natural formations of waterfalls , terraces of limestone pools, and a stream of crystal blue water along the path for the visitors. 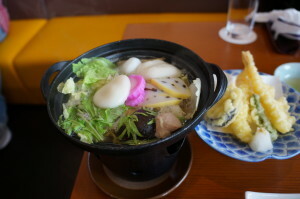 For lunch, we had Kawara-soba at the Royal Hotel Syuhoukan. 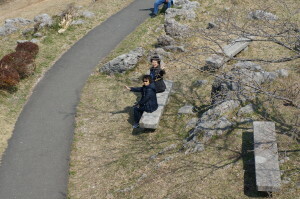 Then we headed for Akiyoshidai Observatory. 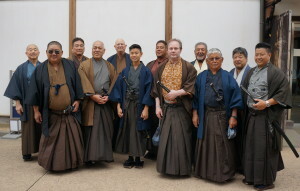 After visiting the observatory, we visited Hagi town and strolled along samurai houses and Shoka Sonjuku school, which was Yoshida Shoin’s (Japan distinguished intellectual) private school. 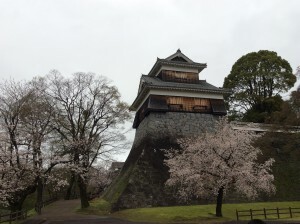 He taught and raised many important figures during the Meiji Restoration Era. 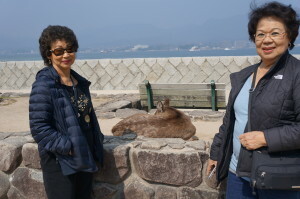 We headed south for Suo-Oshima in the early morning . 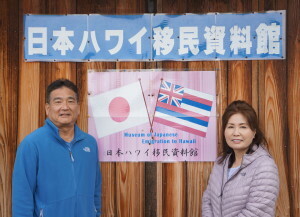 After a 2 hour drive we arrived at the Museum of Japanese Emigration to Hawaii. We had pre arrangements a few days prior, so the office had everything prepared for our visit. Some of us found out about our ancestors, such as where they lived! Very interesting. After that, we looked at many old utensils and documents used by the immigrants at the time. 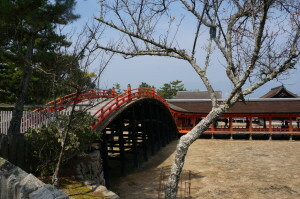 After lunch, we stopped at the open market for a short break and rode the bus for Kintaikyo Bridge a traditional wooden bridge built in 1673. In 1950 The bridge was reconstructed. 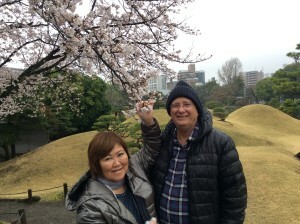 By the fountain we found the cherry blossom tree planted in dedication to the Yamaguchi Kennjinkai (Hawaii Yamaguchi-Iwakuni Organization). The tree has grown substantially! 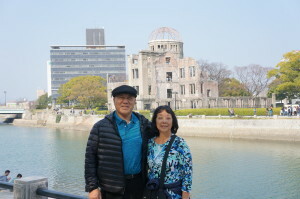 Then we headed east for the final destination: Hiroshima. 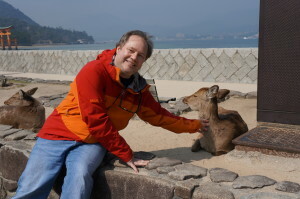 First place we visited Itukushima shrine on Miyajima Island. 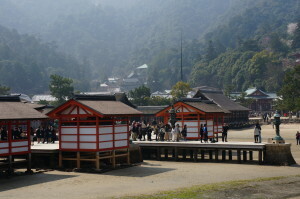 Itukushima shrine was registered as a world heritage for its beauty and history.From the ferry, we saw a stunning red torii gate with hints of cherry blossoms in the background. This is known as one of the three most beautiful views in Japan. We strolled around the park and saw deer. 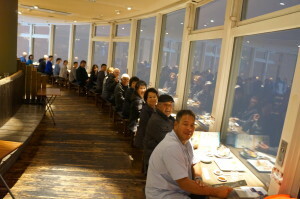 We had a light meal there and rode the ferry back to Hiroshima. 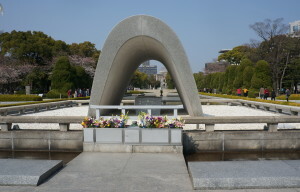 The next destination was the Peace Memorial, which was registered as a world cultural heritage site since 1996. After, we visited the Peace Memorial museum. 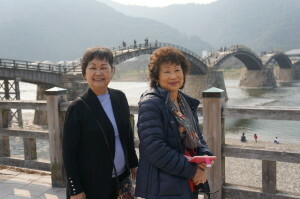 We took pictures and left for Hiroshima Airport. 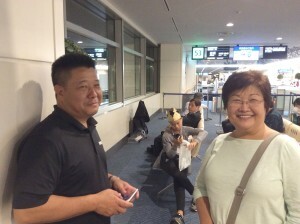 Our flight to Haneda, we had last minutes shopping and snacks and refreshments. 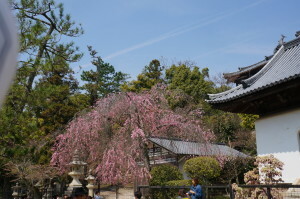 Japan's Most Controversial Zen Temple, Ryoan-ji of Kyoto.